The Dragon World Championship in Fremantle kicked off the 2019 racing season on a high note for North Sails, with North customers making it a clean sweep on the podium. In second place were the British team of Grant Gordon, Ruairidh Scott, Sophia Weguelin and James Williamson on Louise Racing. Here owner-driver Grant Gordon talks about his campaign build up, crew and choice of equipment. The 2018 season saw our team change format to sail four up on our Dragon. The first step in this process was to scout for talented sailors, and we soon identified two excellent additions to the team. Jimmy Williamson joined us as jib & spinnaker trimmer and Sophie Weguelin in the role of bowman and extra pair of eyes on board. With Ruairidh Scott, continuing in his key role of tactician and mainsail trimmer. This was a change of pace for Weguelin, who sailing with Sophie Ainsworth, normally competes in the 49erFX skiff as part of the British Sailing Team. 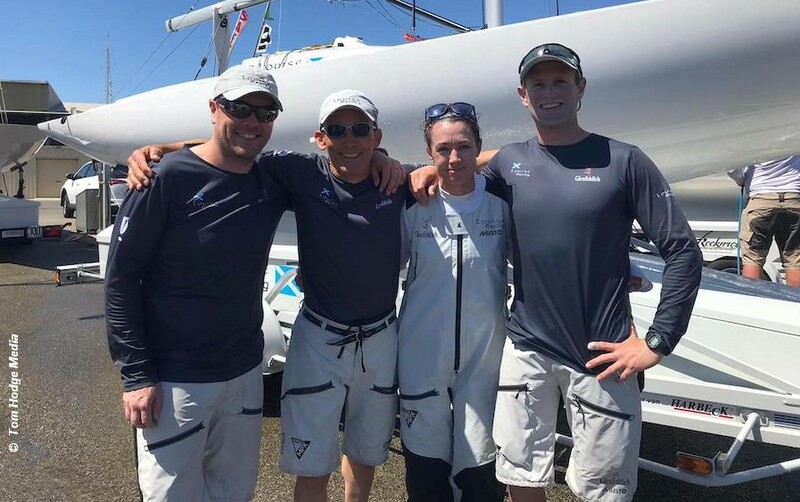 After the Dragon Worlds, Weguelin was off to the USA to compete at the World Cup Miami regatta and the start of the British selection programme for Tokyo 2020. Spending time on the water would unmistakably be critical, and we teamed up with my friend and former Dragon World Champion Klaus Diederichs and the FEVER team. Together we ran a two boat training camp on Lake Garda; which was an ideal venue to prepare for sailing in Fremantle. Naturally, we have worked on tuning the rig using the North Sails Tuning Guide as a start point which gives you instant speed out the blocks. From there it’s just fine tweaks in changing winds and sea states as well as finding the optimal trim settings for the sails depending on the conditions. Making sure the boat is well balanced is critical so you can avoid using any unnecessary helm adjustments. As helmsman, I focused on finding the right heel angle upwind and working with the trimmers to maintain this. Through our training time on Lake Garda, we were able to find trim settings which worked for us and allowed us to be fast consistently. We took delivery of a new Pettricrow V6 Dragon in February 2018. Once the mast was tuned correctly, we were confident that we had an accurate platform to build on. The sail inventory comprised standard North production sails, including an A-7+ Mainsail, R-5 Spinnaker, and V-6M and V-6H Genoas. The heavier wind conditions in Fremantle most often favored sailing with the Heavy Genoa. The combination of the A-7+ Mainsail and V-6H Genoa was very fast in the 14-22 kts wind range we often raced in Fremantle. We have also been equally fast with the V-6M medium Genoa in other venues throughout 2018. Grant Gordon’s top tip be for success in the Dragon class? Assemble a team of talented sailors who respect each other and sail together as often as possible. During training, work hard to address your weaknesses. During the race, when the going gets tough, never give up; it isn’t over until you have crossed the finishing line! Star Junior Worlds - Different fleet, same weather!